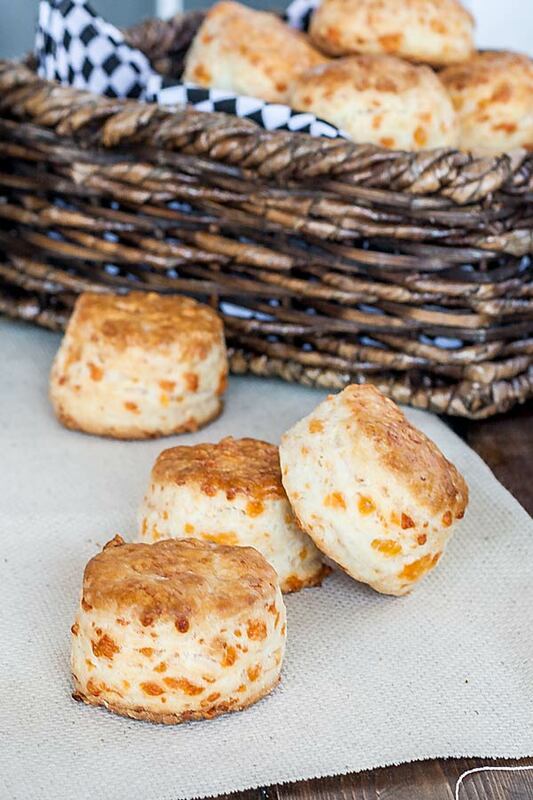 Cheddar Cheese Biscuits are one of those things that I tried baking for the first time… and it was such a pleasant surprise. I used them with anything I could think of, and they are delicious. Try them with jam spread or simply as a sandwich bread. In a large bowl, add the flour, baking powder and salt and mix together. Place the bowl in the fridge for about 30 mins. Meanwhile, cut the butter in small chunks. Let the butter sit out and soften a bit, while the flour is in the fridge. Shred your cheddar cheese if you need to, you will need about 2 cups shredded. Add the flour mixture, butter and cheese to the bowl of your mixer. Using a pastry cutter, mix all those ingredients until the dough forms small peas. Add the buttermilk to the dry ingredients. Continue mixing until the dough comes together, then turn it over onto a floured surface and continue kneading for a few times. Roll out the dough so that it’s about 1/2 inch (1.27cm) in thickness. Next you can use a 2 inch (5cm) cookie cutter, or if you don’t have that, just use a glass to cut out the biscuits. Place the biscuits on a cookie sheet lined with parchment paper or a silicone baking mat and brush them with egg wash.
Bake them for about 25 minutes at 400° F / 204°C and enjoy! In a large bowl add the flour, baking powder and salt, mix well and place the bowl in the fridge for about 30 min. Cut the cold butter into pieces, and let it sit out, we just want it to soften a bit. Place the flour mixture in the bowl of your mixer, add the butter and the grated cheese. Using the paddle attachment mix until the butter forms into small peas. Preheat oven to 400°F / 204°C. Add the buttermilk to the mixer and continue mixing until the dough comes together. Turn the dough onto a floured surface and continue kneading a few times. Roll out the dough so that it’s about half an inch thick. Using a round cookie cutter, you can also use a glass if you don’t have a round cookie cutter, start cutting the biscuits. My cookie cutter was about 2 inches in diameter, that’s why they turned out mini. If you use this size cookie cutter you’ll have about 30 biscuits. Brush the biscuits with the egg wash and bake in the oven for about 20-25 minutes then let cool on a wire rack. 2 inches is about 5 cm, not 2.5 cm. You are absolutely right. It’s been fixed and thanks for correction. Especially as it is soup season here. Cold days made better by soup and something delish to dip in it. I have recently started a food sharing site and would love to have you contribute. Please think about popping over and submitting some photos. I am a member already, thanks.